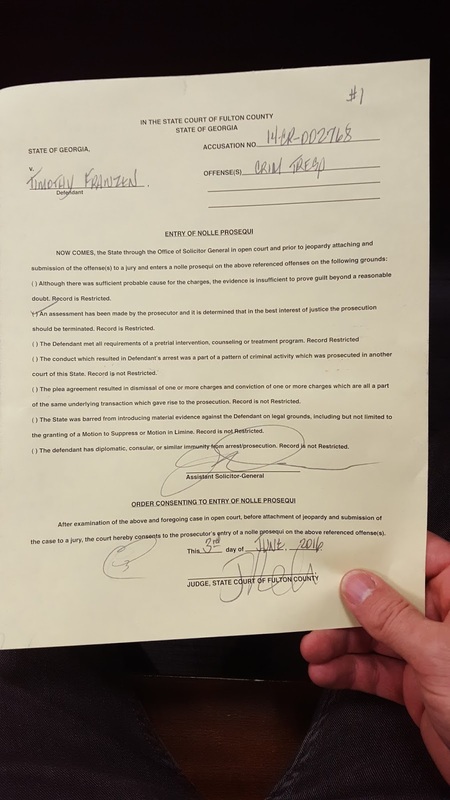 As the final sale agreement for Turner Field is set to be completed by the end of the year, the surrounding communities of Summerhill, Mechanicsville, Peoplestown, and Pittsburgh still have no binding CommunityBenefits Agreement. Today Turner Field area resident and GSU students meet at the capitol to send a clear message to the city and the developers of the Turner Field property. 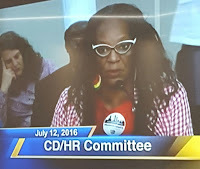 “As residents, we simply can't afford another development project that further displaces our community members and has no real community engagement, and no real accountability to our neighborhoods”, stated longtime Peoplestown resident Alison Johnson. 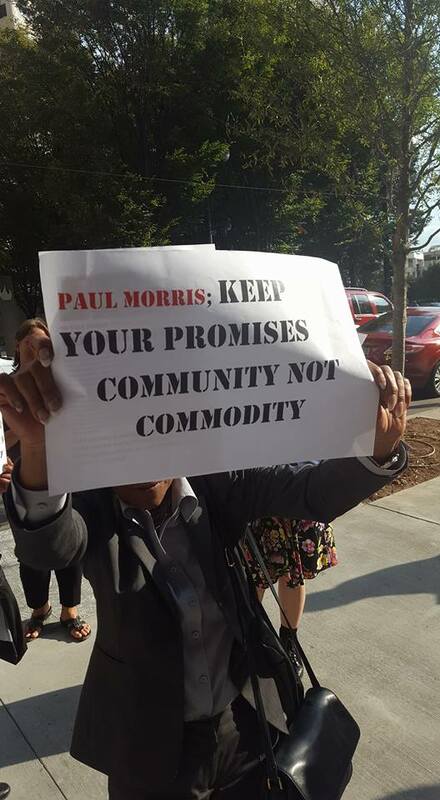 Public officials and development stakeholders have argued that any Community Benefits Agreement negotiation is cost-prohibitive, but fail to acknowledge that the investments and priorities addressed by the CBA could be funded by proceeds from the sale of Turner Field. The sale is expected to generate at least $30 million in revenue, but instead of investing in our communities, our public officials are investing in yet another stadium. 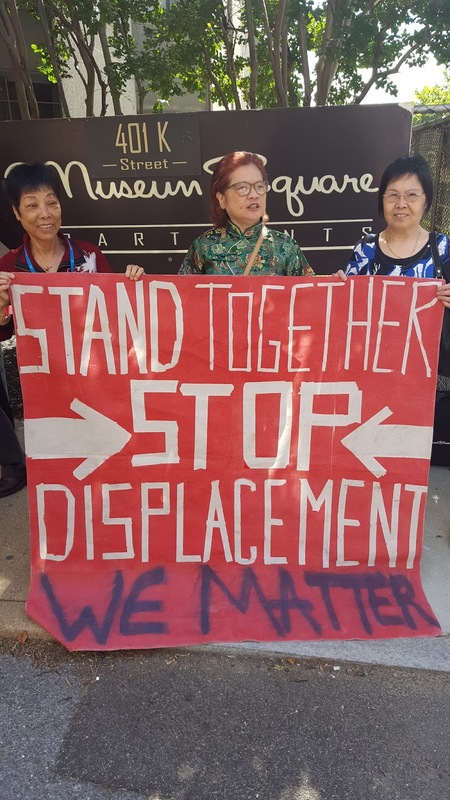 That land was stolen from our community through eminent domain and urban renewal, and we demand that it be returned to the neighborhoods that have lost so much across so many decades. 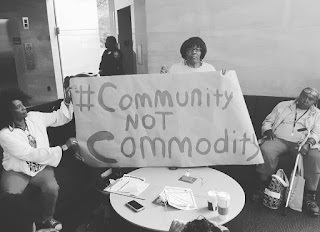 “Students of GSU stand in solidarity with the Turner Field Community Benefits Coalition. We will do everything in our power to ensure that President Becker sits and negotiates a Community Benefits agreement with the coalition. President Becker should expect a good fight from students on this. It is our responsibility to ensure our tuition does not go to a purchase that will not benefit the communities it will affect”, stated the United Students Against Sweatshops, a TFCBC ally. “If we must set up a tent city, we will; if we must chain ourselves to construction equipment, we will; if we must fill the jails over and over, we will. 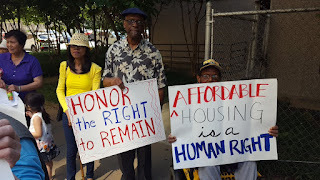 We are prepared to do whatever it takes to stop yet another questionable and inequitable development project in our community, and we call on everyone to stand with us in our time of need!” Stated longtime Peoplestown resident Columbus Ward. Sign and share the onlibe petition! 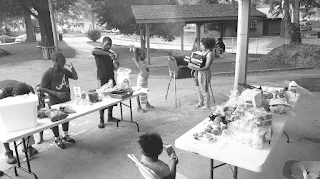 Read the Turner Filed Community Benefits Coalitions platform here. On Wednesday, Dec, 14th, members of the Turner Field campaign coordinated a direct action at Georgia State University’s mid-year commencement ceremony. 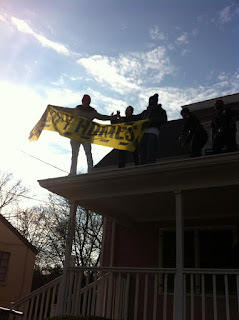 During the University System Chancellor Hank Huckaby’s commencement address, residents and students intervened with chants of “Dr. Becker, do the right thing” and “CBA or no deal.” Their chorus sounded through the Georgia Dome, and received focused attention from Hank Huckaby and Mark Becker. 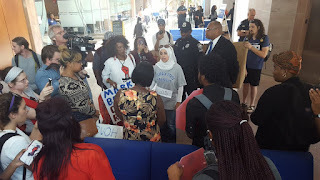 Huckaby berated the protestors, and incited police officers to remove them from the seating area. 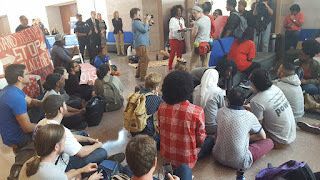 Asma Elhuni, JT Pennington, and Athri Ranganathan were pushed out of the Dome and taken to a holding room. There, they were detained and interrogated by police for two hours. 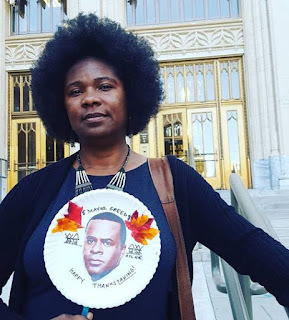 The encounter was largely non-confrontational, though officers handcuffed Ranganathan and claimed he was lying about his name, date of birth, and social security number. After a delayed acceptance of Ranganathan’s information, officers issued criminal trespass notices to all three individuals. 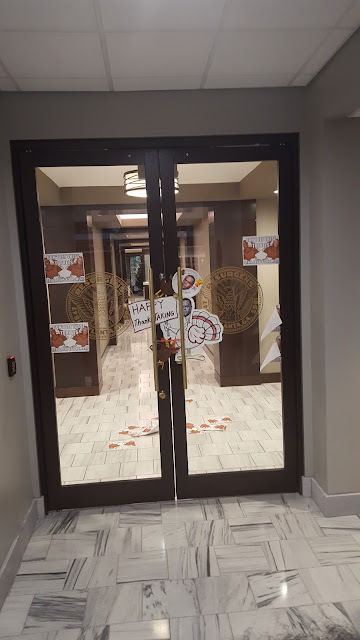 Asma, JT, and Athri are currently under a two-year ban from entering Georgia State University property. They are amidst discussions on how to fight this heavy-handed ruling. 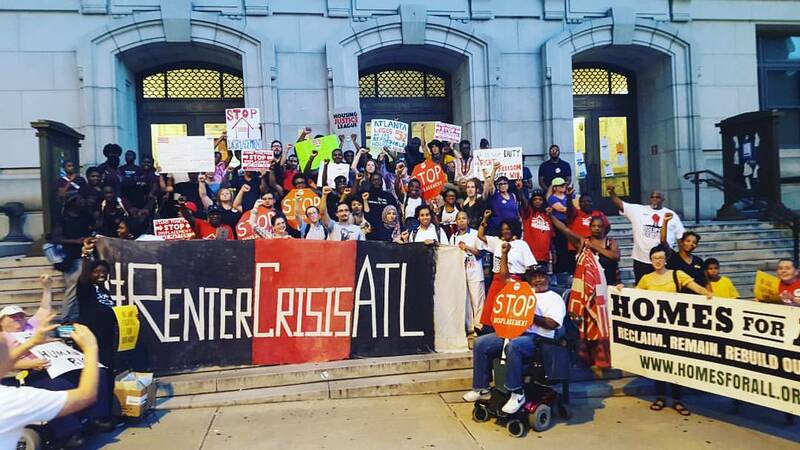 The administration's back-turning to Turner Field residents, unwillingness to negotiate, and drowning of voices has incited community anger. 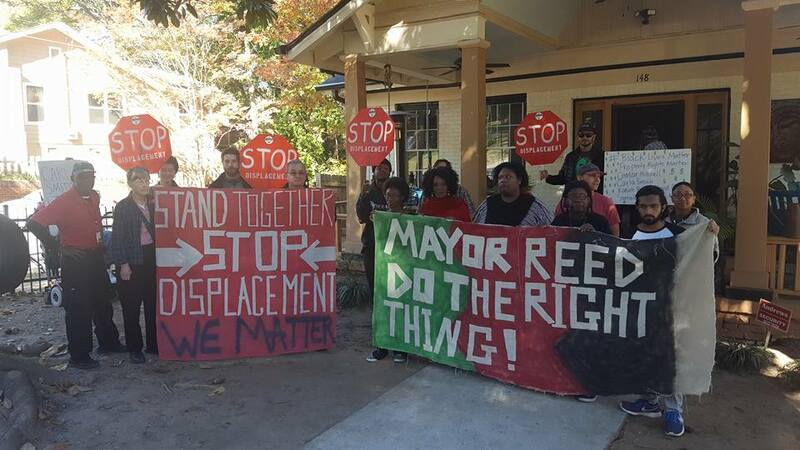 The action was an intentional jab at GSU President Mark Becker and his refusal to discuss a Community Benefits Agreement with Turner Field Neighborhood residents. 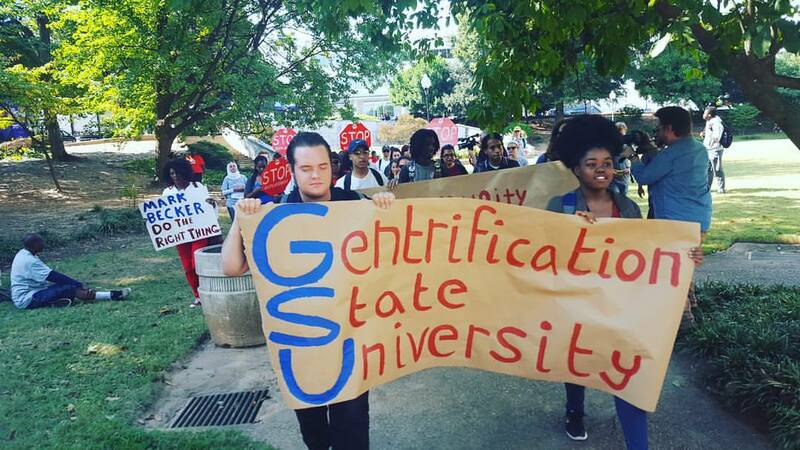 The threat of GSU-sponsored displacement of Turner Field residents is imminent, and must be countered. The Housing Justice League and its allies stand against the removal of Turner Field residents from their homes. 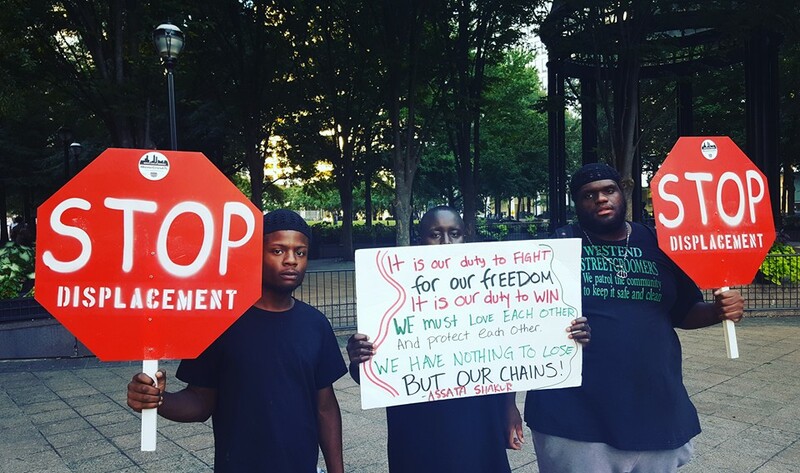 It will continue this fight as the purchase deal moves forward and effects ripple through the Turner Field neighborhoods. GSU is finalizing its purchase of the Turner Field stadium on Dec. 31st. 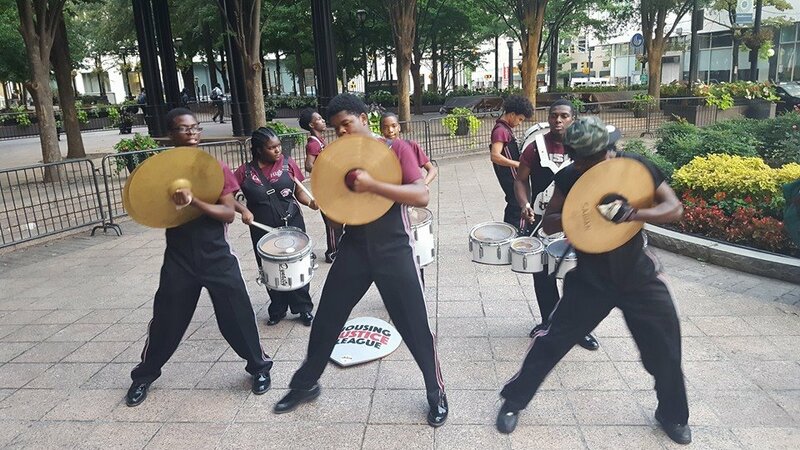 The Turner Field campaign, a broad coalition of residents and students, is fighting for this purchase to benefit the community. 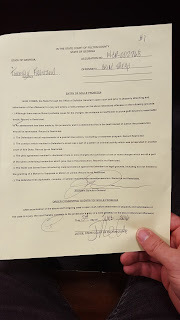 The Community Benefits Agreement for which it is fighting ensures that GSU must gain community consent before developing the Turner Field stadium. 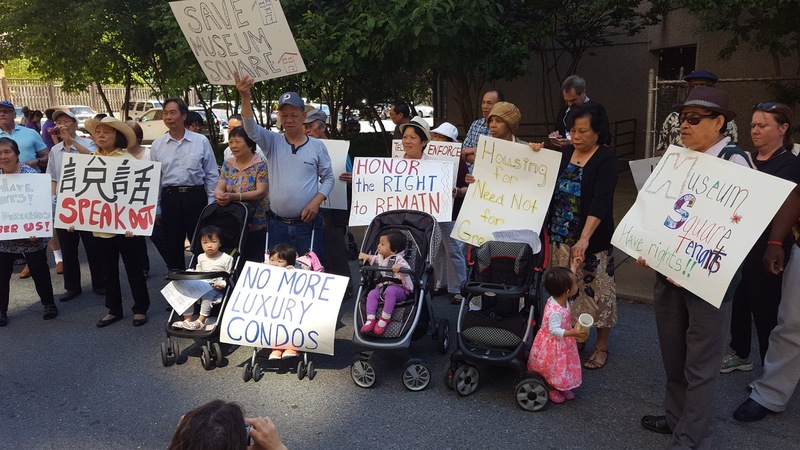 The campaign prioritizes the right for residents to remain in their homes and for the community to regain legal ownership over its property. 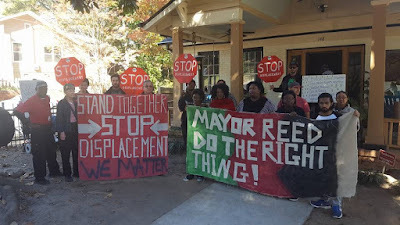 Turner Field residents demand that their voices be lifted up and seriously considered. Residents and students gave a public warning to Mark Becker and his administration on Wednesday. 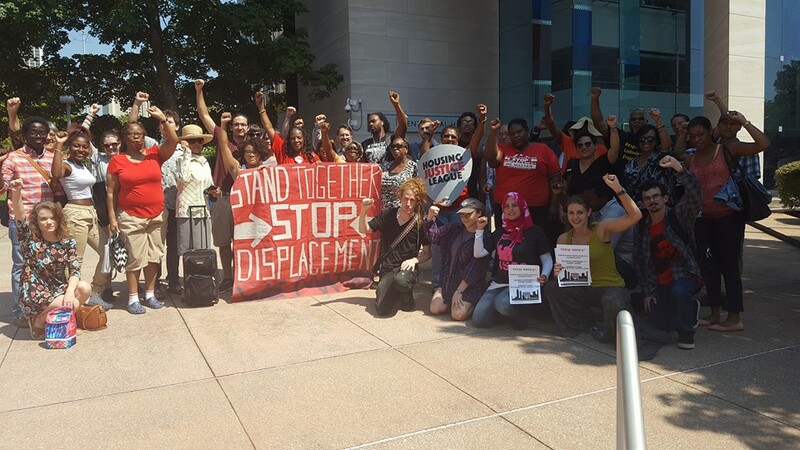 The campaign commits to continuing action until GSU seriously engages residents and their demands. There is much at stake in the purchase deal, including the future of the Turner Field neighborhoods-- it cannot be taken lightly. On noon, Tuesday, October 4th at Hurt Park, GSU students and NPU-V residents joined the Housing Justice League to deliver a petition to GSU President Mark Becker’s office. 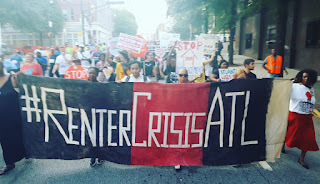 The direct action was geared towards securing a legally-binding Community-Benefits Agreement (CBA) that ensures residents of Turner Field neighborhoods benefit from positive development around their homes. The rally began in a sunlit Hurt Park at noon, with joint cadres of Georgia State University students and NPU-V residents. Many held signs that read, “Stop displacement on our dime,” “Students and residents march together,” and “Gentrification State University.” Half-past the hour, student organizer Patricio Cambias Rojas rallied students and gave an overview of the action. 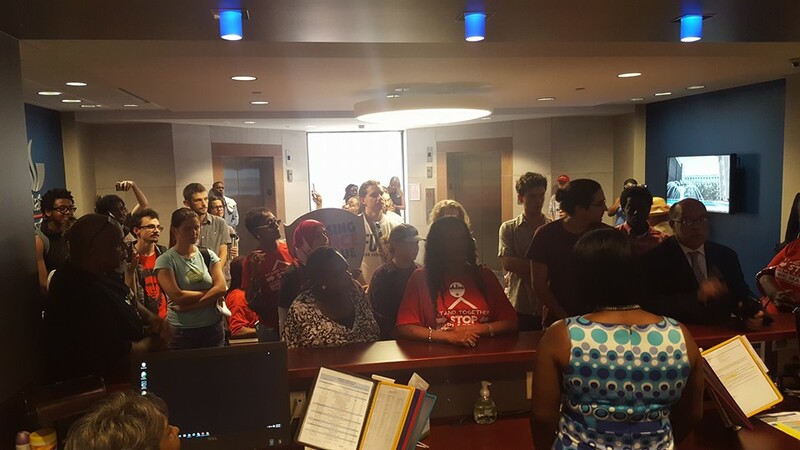 Co-organizer Christopher Hollis took lead in giving chants, and marching students and residents towards Becker’s office. In the building of Centennial Hall, marchers learned that President Becker was “out” for the day-- his absence has not been confirmed by independent sources-- and that they would not be allowed into his office. Housing Justice League organizer Sherise Brown and GSU organizer Asma Elhuni delivered a petition to Becker’s secretary in lieu of Becker, and restated the demand that Becker meet with marchers to discuss a CBA clause within GSU’s purchase package. Brown noted, “We are following up on our last march to your office, and we wish to meet with President Becker. 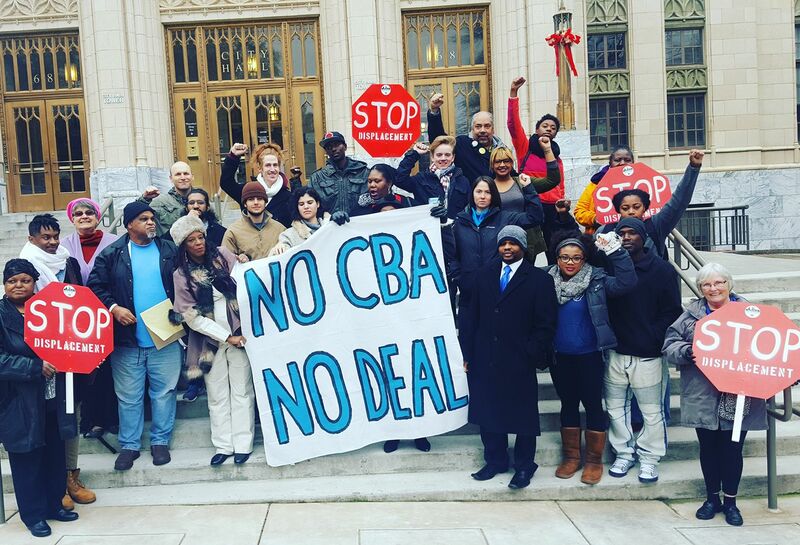 Please let him know that we are sincere, and want to discuss the mutual benefits of a CBA.” As of now, Becker’s office has given no response. 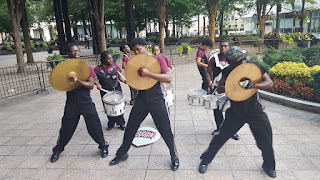 The Turner Field Community Benefit Agreement (CBA) is a valuable opportunity to reorganize administrative priorities and change the neglect of Turner Field. 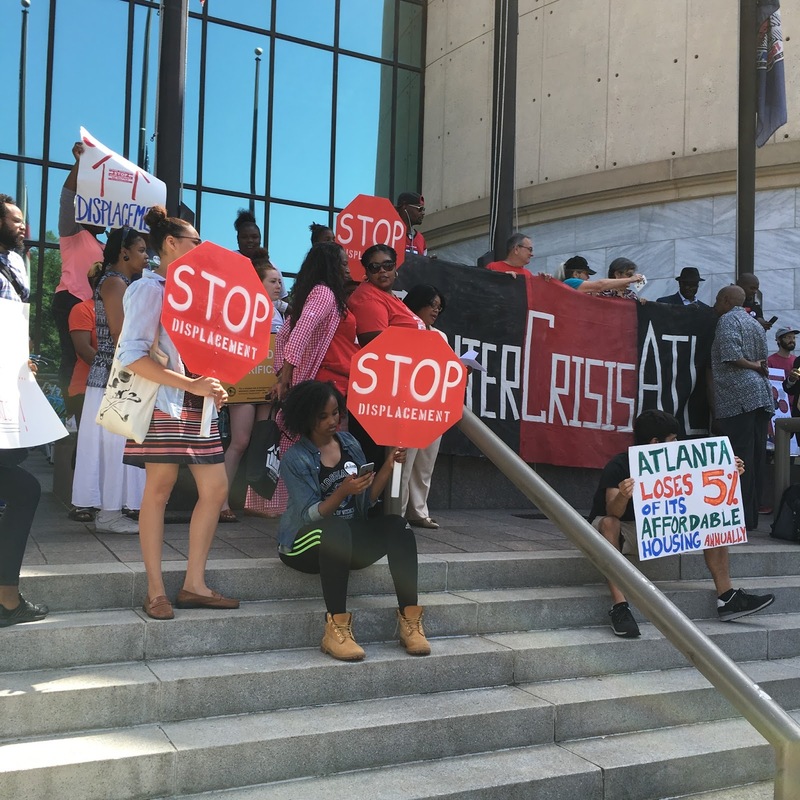 This legally-binding agreement has driven by local residents and the over 40 community organizations that make up the Turner Field Community Benefits Coalition. 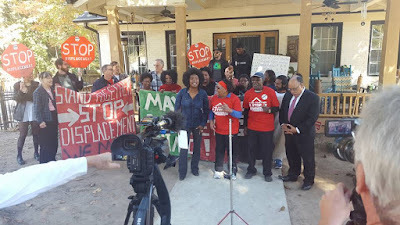 A CBA would mean tremendous change for all involved in the Turner Field neighborhoods. 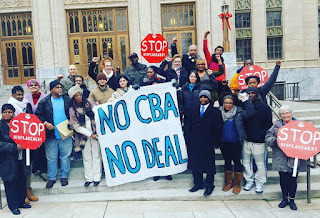 A well implemented CBA could alleviate flooding, improve transportation, provide jobs for residents, and include educational training for people of all ages. 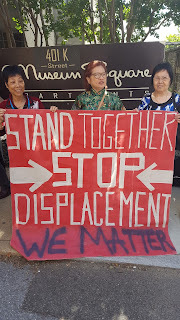 It could prevent displacement of existing residents, create housing for people of all incomes, provide the neighborhood with places to shop, and make streets and communities safer and cleaner. The Housing Justice League, NPU-V residents, and GSU students are committed to demonstrating the power of a Community Benefits Agreement for our communities. On Tuesday, October 4th, we showed this commitment by rallying to Mark Becker’s office and delivering our petition. And we will continue pushing, and escalating, to create a more affordable, better serviced Atlanta. Please SIGN and SHARE the online petition. Atlanta is in a renter’s state of emergency. How many of us have engaged in or overheard conversations with folks in our city about the rising rents and rapidly changing face of our city? Development doesn’t have to be a bad word, but what we are seeing in Atlanta right now is the kind of development and wealth extraction that will leave Atlanta totally unaffordable for low and moderate income people. 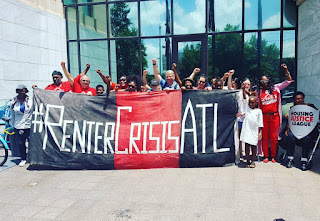 On Tuesday July 12th at 11am on the Trinity side of Atlanta City Hall the Housing Justice League released our, “Renter's State of Emergency” report and declared Atlanta a state of emergency for renters and low income homeowners. After the press conference we presented the report to City Council members. 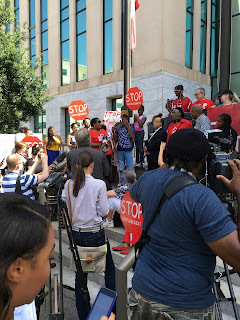 The Rally and Press Conference kicked off with welcoming and introduction to the report from Deborah Arnold. Senator Fort then spoke declaring that "We need to build an Atlanta for everyone." Senator Fort was then followed by stories from those who have been most affected by Atlanta's Renter's State of Emergency. 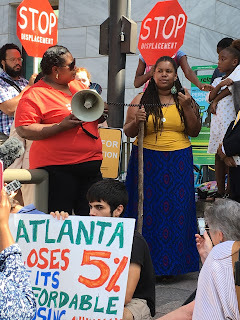 Autumn Rivers, Atlanta Native and a college student a Bard College, spoke about her experiences growing up in Atlanta, being evicted, and hoping to move back to Atlanta after College, but not being sure if she will be able to afford to. Avery Jackson said, "There are systemic intersections of how black people and low income folks are not prioritized in this city." 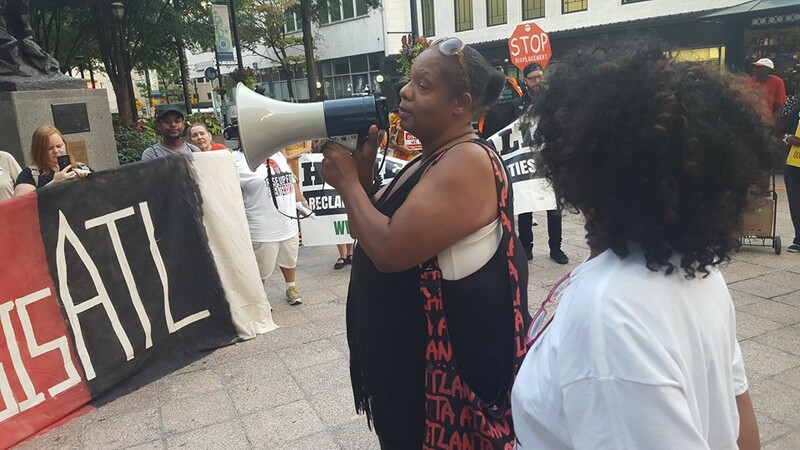 and declared "it is a renter crisis in the city of Atlanta." Nashia Clemons and Rosalind Hemphill, work and make $7.25 an hour and are both homeless. 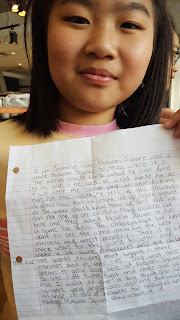 Rosalind Hemphill said, "I sleep outside. I can't afford anything. I've been here for 20 years." 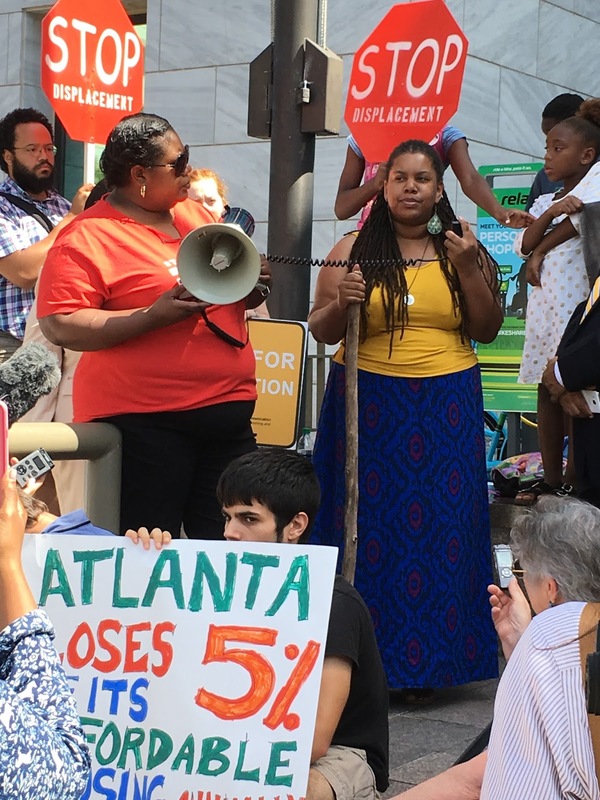 With Atlanta's current rent prices, it makes it difficult for hard working people to afford rent, especially if they are working for minimum wage. Z.Bediako, a third generation Atlantan, spoke about her families experiences living in Atlanta, as well as her own. 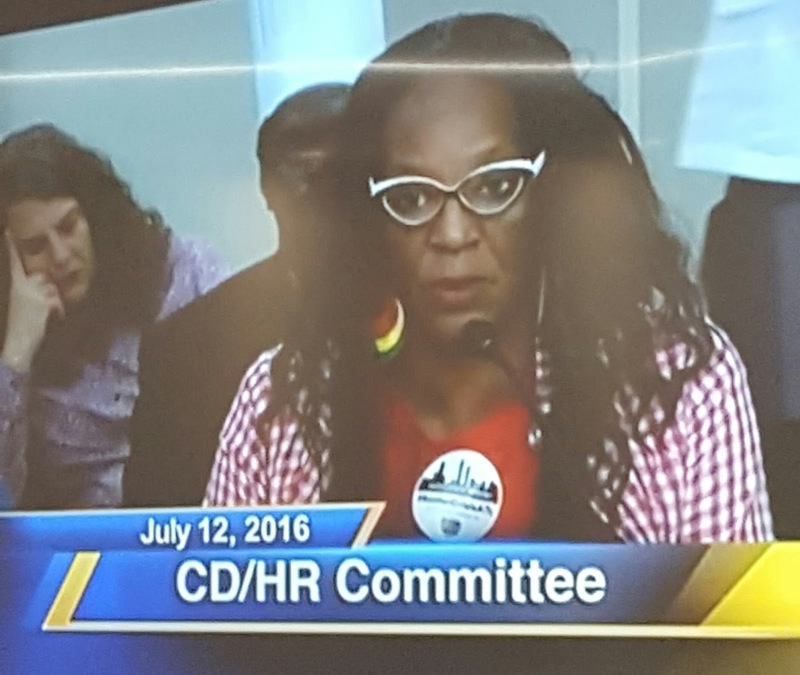 "We are here today to demand that housing is a human right. When you walk up and down downtown and you see people on the side of the road, thats not a representation of bad luck, thats not a representation of misfortune, that is a representation of oppression, systematic oppression." 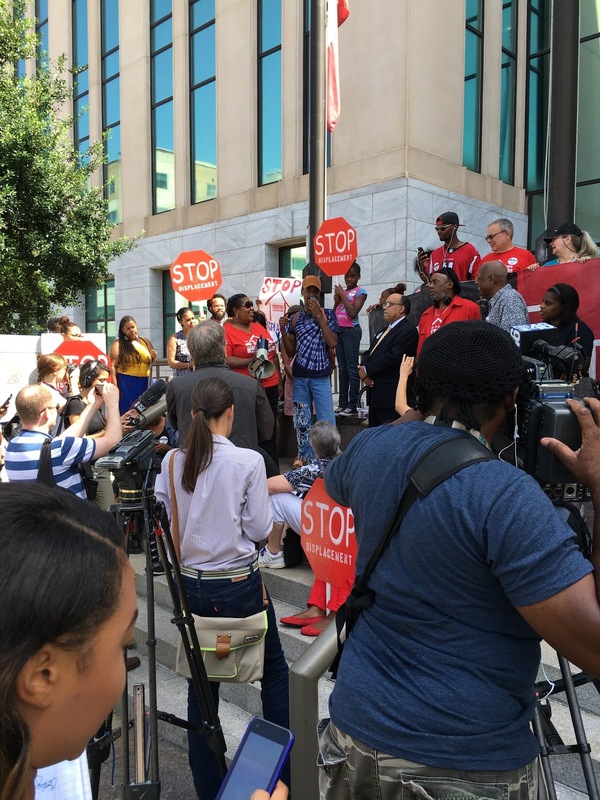 David Waid, a Marta worker, who can no longer afford to live in the city he works in said "What our reality is, we can work here, but we can't live here". The last speaker was Vera Web. Web lives in a senior facility and spends 60% of her income on her rent because her rent has continued to increase each year. "My rent increased by $85 a month this year, not because the place got fixed up, simply because they felt they could charge more despite the fact that we are seniors who are mostly on a fixed income"
After the Rally finished, members of the Housing Justice League went into City Hall to deliver the report to the Community Development and Human Resources Committee. 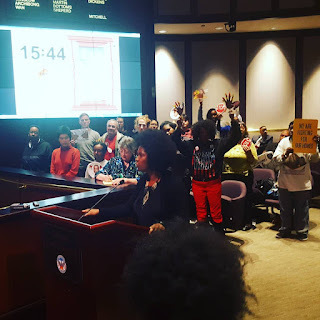 Sherise Brown and Alison Johnson gave public commentary about the reports findings and delivered the report to City Council members. On July 19th, at 6:30pm in the City Council Chambers at City Hall (55 Trinity Ave SW) there will be a public hearing, where people struggling to afford Atlanta can testify and share their housing story with local and state lawmakers. This hearing is the opportunity for law makers to hear stories of those experiencing an affordable housing crisis. The hearing will be presided by Councilman Dickens, Councilwoman Moore, Rep Park Cannon, Senator Fort, and others. Please sigand share the online petition to Georgia law makers! 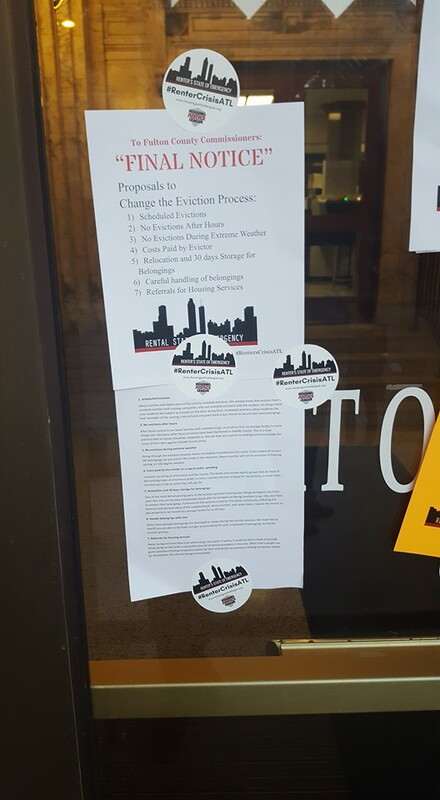 To read the full Renter's State of Emergency Report click here! Five Quaker organizations from Europe and the United States have expressed concern about the Transatlantic Trade and Investment Partnership (TTIP), the controversial ‘mega’ trade deal being negotiated between the European Union and the United States. It is the first time that Quaker organisations, working on both sides of the Atlantic, have spoken out together about such a trade treaty. 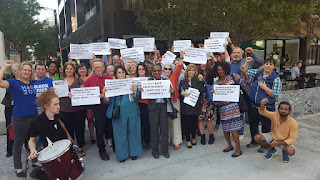 American Friends Service Committee, Friends Committee on National Legislation, Quaker Council for European Affairs, Quaker United Nations Office and Quaker Peace & Social Witness, have sent a statement to Prime Minister David Cameron, government representatives and trade officials. They say that TTIP negotiations are prioritising the prospect of short-term economic gain over the longer-term factors necessary to human wellbeing and protection of the Earth. The statement comes in the context of building opposition to TTIP, as controversial, confidential negotiation documents were leaked into the public domain and the French government has warned that it is considering blocking the deal. 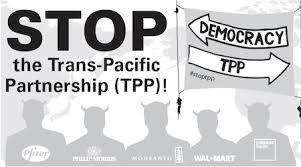 The Quakers say that TTIP will almost certainly hamper international commitments to tackle climate change and global poverty, including the recently agreed Paris Agreement on Climate change and the UN Sustainable Development Goals. 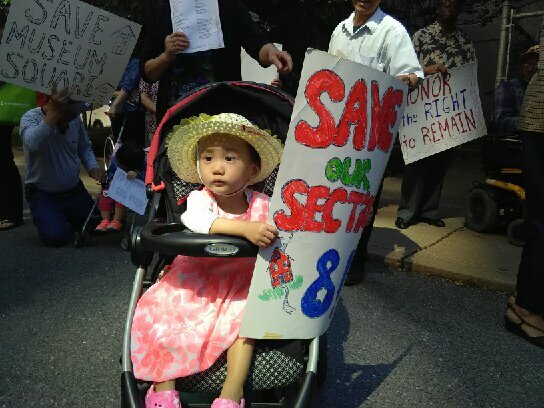 Quakers are calling for a fundamental rethinking of global trade rules and for future trade deals to be aligned with the demands of these commitments. 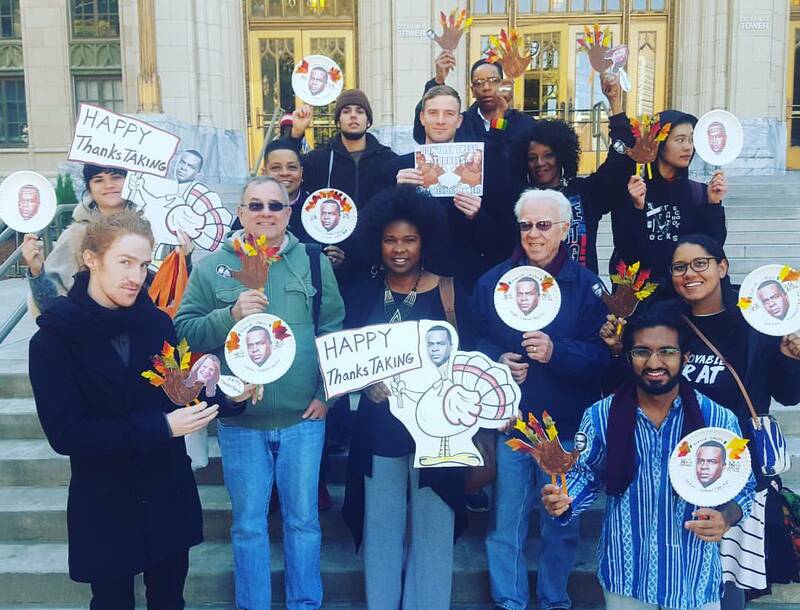 · Quakers are known formally as the Religious Society of Friends. Their commitment to equality, justice, peace, simplicity and truth challenges them to seek positive social and legislative change. · The Quaker Council for European Affairs brings a Quaker vision of just relationships to the European Union and the Council of Europe. QCEA has worked on trade issues and TTIP since 2013, advocating for trade deals to prioritise the well-being of people and planet, above profit. 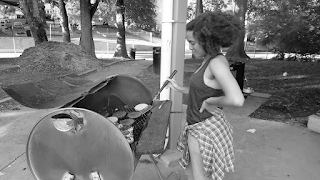 · The American Friends Service Committee is a Quaker organisation that promotes lasting peace with justice, as a practical expression of faith in action. This work has included decades of grassroots education and advocacy for trade policies that place human dignity, economic justice, and environmental sustainability the heart of the global economy. · The Quaker United Nations Office works with the UN, multilateral organisations, government delegations, and non-governmental organisations, to address the interconnections between trade, investment, intellectual property rules and how they relate to poverty, hunger and food insecurity. QUNO engages with all stakeholders from small-scale farmers to trade negotiators, providing safe spaces to explore how the food system could be made to work for the whole of the world’s population. · Quaker Peace & Social Witness works with and on behalf of British Quakers to turn faith into action. It is a department of Quakers in Britain, whose representative body discussed TTIP in July and December 2015 concluding that it had “deep concerns about the impact of the proposed agreement”.